Is there such a word as Muralist? We talk to a man who does things to walls. 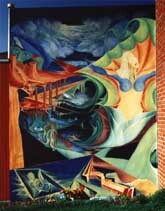 The wall featuring “…and Then The Goddess Began Conjuring Herself Up Out Of The Palm Of My Hand.” by Michael Gullberg. What is the full title of the piece seen above? …and Then The Goddess Began Conjuring Herself Up Out Of The Palm Of My Hand. Where is this mural located? 2317 Lakeshore Avenue in Echo Park, just west of Dodger Stadium in Los Angeles. It’s on the side of a house. There’s a brick wall in the photograph which gives us some sense of scale, but exactly how big is it? Fourteen feet high, eleven and a half feet wide. There’s actually some rocks and stuff down below which help to put in perspective. I started at the end of October in 1996 and I had an unveiling party on May 18th 1997. That’s seven months. While you were painting the mural, was the public passing by, watching you? What kind of paint is it? What’s the medium? Well it’s actually house paint. Behr exterior latex acrylic semi-gloss paint from The Home Depot. The background surface is Stucco, primed. It’s long one. Forty feet long and about seven and a half feet high. It must be easier when you don’t have to climb up ladders all the time. Yeah, it’s a little bit easier. I still need to get a stool to reach the top two feet. This one’s gonna take a while. I probably not going to be done with this one for another year or so. Yeah. Diego Rivera was a Muralist. Upon who’s house is Goddess painted? The current owner of the house is John Duffy, but when the work began, the owner of the house was a woman who owns about four of my smaller painting, Carol Sherman. It was her wall and originally she was thinking about simple silhouettes or something like that. And then we started kicking around some ideas. There was some Indian imagery that she liked and I think that’s where the Goddess came from. Carol was very much into the Goddess aspect of the feminist movement also. So the Goddess was more of a symbol of empowerment than an actual God-like potent being? It’s not a specific, it’s an all encompassing universal female/feminine energy. What’s the difference between painting a large mural and painting something two feet wide? It depends on the artist! For me, what I have found is that with smaller canvases I was cramming a lot. I was putting a lot into one small painting. Somebody said to me once, you’ve got to start painting bigger. This was after I had painted Goddess, and I started to notice the difference. There’s a lot of emotion and energy in my work and I pour that emotion into it. A lot of big emotion, and I think the extra space affords you more freedom with that. I express myself more fully on a large space. So it’s not just a case of it being larger so you can see it from further away, there’s something more to see if you are close to the piece. From every perspective, from far away, from up close from the sides, from the top. That’s the whole thing, I’m creating other worlds. Have you ever thought about camouflaging a building and making it blend into its background? Even though this mural sticks out, it’s colors blend into the hillside. The painting is affected by all of its surroundings. This is more apparent in my current work. I’m affected by all the surroundings, even the insects. One of the things that I started to understand when I first started painting this mural, is I’m actually painting landscapes, other worlds, on top of the ants’, insects’ and spiders’ world. They’ve actually visited while I was painting. This one spider which looked almost futuristic and robotic, with things like wipers on it’s eyes, came into my field of vision and looked up right at me, and I realized at that point that in creating something like a mural, you are also destroying something. On my current piece, the lizards come out of the drain. I disrupt the ants many times. Ants are crazy, they get right in the line of the brush, they’ll come right up to the brush and sacrifice themselves for the beauty of art. I’m in touch with the animals and the insects too. Murals have brought me back to that kind of stuff. I was raised in the woods in the rural areas of Pennsylvania. What about decay and maintenance? That’s one of the reasons I use Behr house paint. It has a fifteen-year guarantee. I also use a clear coat, a graffiti coat I’ve been watching this mural for the past three years. With the amount of paint I’m putting on, I could literally peel that thing right off the wall. So it’s like a big latex skin on the wall. It’s like an art condom. Do you have to keep stepping back to have a look at the piece? I walk all the way up the street, walking backwards, holding my paintbrush. There are a lot of varying perspectives. Do you use an outline first, or a slide projector? No, no, no. This mural was strictly out of my head. The planning and design elements were as I was going. I used tape for certain perspective lines. At an early stage in this piece, carol said, “You know what, I like what you paint, I like your style, so just go ahead and paint whatever comes to you.” And I did. A lot of my work evolves as the paint is being moved around. All of a sudden things reveal themselves in the paint. I let go enough to allow the paint to kind of show me what to paint, basically. You sign your work “Michael”. Is that your artist name? It was, now I’m thinking of using my whole name, Michael Gullberg, but the single name Michael looks better as a signature on the paintings. What would you like to say about being a Muralist? Buy more murals! No reasonable offer refused. PreviousPrevious post: The Wonders of Southern California’s Historic Ridge Route.